It's official! 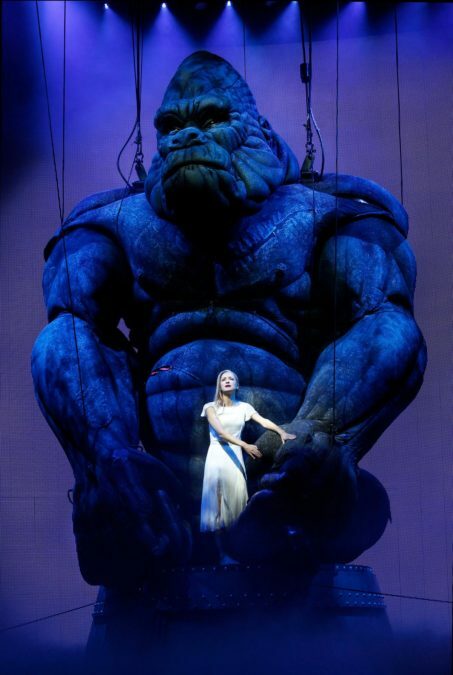 The long-gestating musical adaptation of King Kong will open at the Broadway Theatre in the fall of 2018. Set to feature a score composed and produced by Marius de Vries, songs by Eddie Perfect, and direction and choreography by Drew McOnie, the musical will include a book by Jack Thorne, whose London hit Harry Potter and the Cursed Child will open on Broadway in April 2018. The arrival of Broadway's King Kong, a contemporary take on the classic tale of beauty and the beast, follows a lengthy journey of developmental readings, workshops and a prior production in Australia. As first reported in 2010, Craig Lucas was initially set to craft a book for the musical, which at that point was scheduled for a 2013 Broadway bow. De Vries was the overall composer from the start, with direction by theater and opera vet Daniel Kramer. In 2012 Grammy winner Sarah McLachlan announced that she was onboard to write a song for the musical's June 2013 out-of-town run at the Regent Theatre in Melbourne. That mounting included revamped 1930s Broadway songs like “Get Happy,” “I Wanna Be Loved by You” and “Brother Can You Spare a Dime,” as well as new and existing numbers from McLachlan, Robert Del Naja, Justice, Guy Garvey and The Avalanches. A Broadway bow was then delayed to open in December 2014. The main stem mounting was further held off to tweak elements of the massive production that debuted in Australia. Urinetown Tony winner John Rando was brought on as the musical's director with Secret Garden Tony winner Marsha Norman as book writer. Jason Robert Brown, who collaborated with Norman on The Bridges of Madison County, was brought on to compose music in September 2015. Norman departed the project in October 2016. The fall 2018 Broadway bow of King Kong will feature scenic design by Peter England, costume design by Roger Kirk, lighting design by Peter Mumford and sound design by Peter Hylenski. Gavin Robins is the aerial and movement director. Sonny Tilders is credited as creature designer. King Kong’s first preview, opening and on-sale dates will be announced in the coming months. Casting and additional members of the creative team will also be reported later. The Broadway Theatre is the current home of the Miss Saigon revival, which is set to conclude its limited run on January 14, 2018.